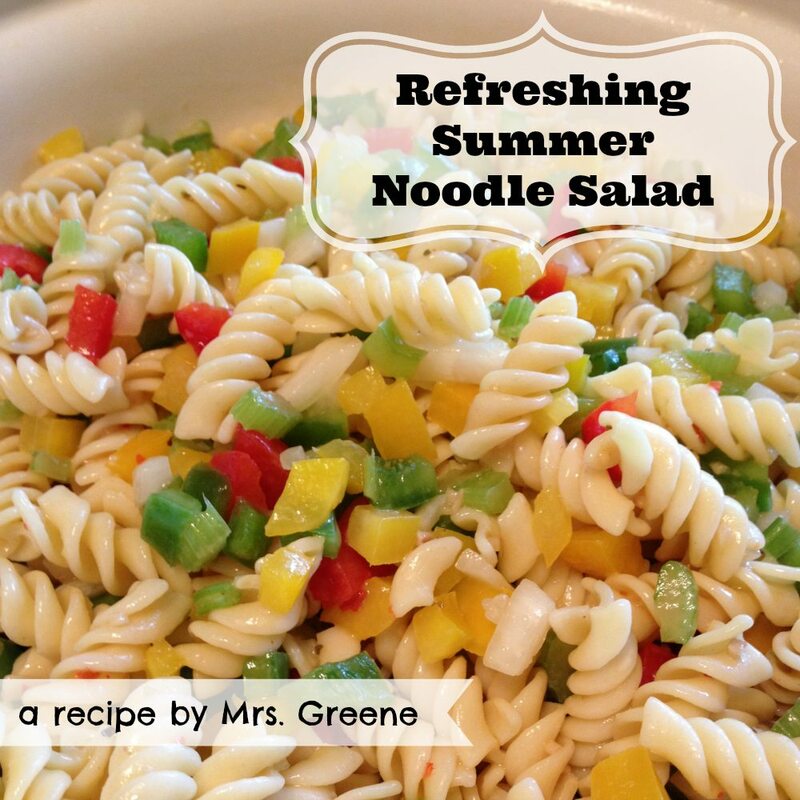 Refreshing Summer Noodle Salad | Oh, That Mrs. Greene! I have a love/hate relationship with noodle salad. The good ones are amazing, but honestly, I’ve had a LOT of bad ones. Which I find shocking, because making a good noodle salad is one of the easiest things to do in the kitchen! I think a big part of the problem is that people try to get too fancy with their recipes. My favorite noodle salads are always the simplest! For this noodle salad, I decided to go with Italian dressing rather than a heavier, mayo-based dressing. It gives the salad a light, refreshing flavor that is great on a hot day! I also added lots of veggies, making it heavy on the “salad” aspect. I whipped up a gigantic bowl of this stuff for a big family dinner the other day and it was a huge hit with everyone! Make sure you scroll down to see the whole recipe (it’s even printable! ), and make sure you also check out the list below of over 20 other great recipes to add to the menu of your next picnic! Chop all veggies into small pieces. In a large bowl, combine noodles and veggies. Stir in dressing until the salad is evenly coated. Refrigerate for at least 1 hour; overnight is best. As the salad chills the noodles will absorb some of the dressing, so you may need to stir in a little additional dressing before serving. Make sure you also check out these other great summer recipes from some of my friends! Add some black olives (whole), cucumber and shredded parmesan cheese! It’s so yummy! We omit the celery. I love pasta salad!! This looks delish! Yummy! This will make it to our weekly meal plan soon!